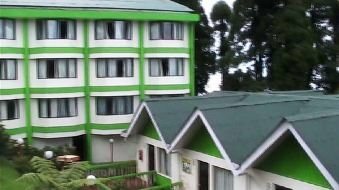 Sterling Resorts in Darjeeling Hills is a unit of Sterling Holidays Resorts Limited, the company that offers vacation ownership or timeshares. Although this resort is mostly used by the vacation owners, it can also be booked like any other hotel. The resort is located in the Ghoom area and about 8kms away from the Darjeeling Town. From the Hill Cart road and after the Ghoom station, a narrow road on the left leads to the Ghoom Monastery. And just before the monastery, a steep uphill turn to the right takes you to the resort. So why come to Sterling Resorts which is some 8kms away from the main town center of Darjeeling? Because you don't come here to be in the middle of the bustling hill town. You are here to absorb the serenity and the sheer views of the nature and the snow clad mountains of the Himalayas. And all that in a 3-star luxury. Some say that the view of Kanchenjunga from the backside of the resort is even better than what you see from the Tiger Hill. As you drive up the ramp into the hotel premises, there is a car park right in front which is almost always full. That's because you can not reach the resort by any public transport. So many prefer to keep their rental vehicles with them during their stay here. You will see the curving stairway leading to the reception hall of the main building. The main building has 28 regular guest rooms. Rest are cottages that are laid out in the backside of the main building. There are cottages with one bedroom, two bedrooms and compact studios. There are total 103 rooms in the resort. A typical double room cottage is of duplex type. At the ground floor there is a small kitchenette equipped with hotplates, crockery, cutlery and other stuff. However if you are not a vacation owner, there is an extra charge for using the kitchenette and the cutlery for cooking food. There is a grocery store in the premises which is open for few hours in the evening from where you can buy some of the basic raw materials for cooking. It also sells mineral water and cold drinks. Downstairs in the cottage there is also a living room with extra beds. Upstairs there are two rooms and bathrooms. 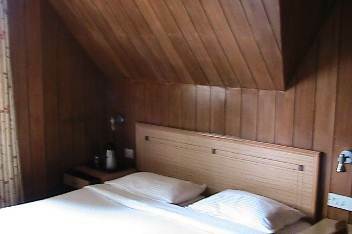 The rooms have slanted ceilings with wooden finish. The bathrooms are nice and have geysers with showers for hot and cold water. With counter type wash basins and toiletries provided, the westernized bathrooms look quite stylish. The standard guest rooms in the front building are also quite nice. All have in-room TVs and other standard amenities. 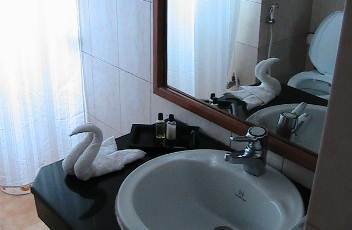 However during the high season, there has always been complaints of maintenance and cleanliness in this resort. At one side of the reception there is a lobby with nice comfy sofas where you can relax. In the main building there is a multi cuisine restaurant called The General Lloyd that prepares Indian, Chinese, Tibetan and Continental dishes. However during the low season, the buffet is often closed and they provide food in the rooms. There is a small souvenir and gift shop tucked on one side of the reception area. It sells various items like bags, belts, woolens, jackets, shoes etc. There is travel desk that organizes airport/station pickups and drops, sight seeing tours, treks etc. Other amenities in the resort includes safe deposit vaults, wheel chairs for disabled, in-house library, car park & car wash etc. There is a wellness Spa called Subuthi. The hotel offers some entertainment activities also. There is a play area for kids having swings, slides etc. Other activities include board games, table tennis, badminton, cycling and outdoor games. During the high season the resort also organizes theme party nights, live bands, campfire etc. There is a small amphitheater where entertainment shows are held at times. The resort also offers conference and banquet facilities for corporate events. The conference room has a seating capacity of 200 and has all the conferencing equipment and facilities similar to that of a business center. The check in time at the resort is 12 noon and check out time is 10am. 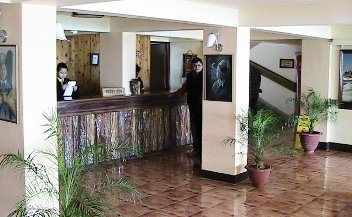 The resort is located about 30 minutes driving distance away from Darjeeling town and in a secluded area. So if you have plans to be close to the main attractions and activities of Darjeeling, this is definitely not the place to stay. This resort is meant for those who just want to spend some quiet time in the hills far away from the crowd, relax and enjoy the views from the rooms. Other than the Ghoom Monastery which is located just below the resort, you can not walk down to any other place of interest from this resort. There is nothing much to do here other than relaxing and absorbing the ambience of the surroundings. If that's not exactly what you want, you will end up killing your precious time playing table tennis here. You can of course hire a car and go down to the Darjeeling town if you so want. The food served in the restaurant is a little bland and overpriced. Sometimes they offer a package for dining which works out to be more economical and a better choice. Remember that this is essentially a vacation owners resort who mostly take up the cottages and cook for themselves in the kitchenette available in the cottage. 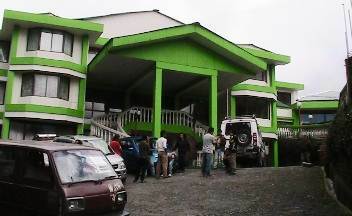 Sterling Resorts in Darjeeling offers 3-star amenities and rooms. For its location and quality of rooms, this resort is little overpriced for guests who are not vacation owners and therefore book directly like in a hotel. During the high season, maintenance and cleanliness can become an issue. The car park area in front of the main building often remains chaotic and full with drivers. Don't be surprised if your car is not allowed up to the building entrance. The service in the resort is average and acceptable. While coming from Bagdogra or Siliguri, 50 meters after Ghoom Railway Station take a left turn into the Old Monastery Road from the Hill Cart Road. The Sterling Resort is about 10 minutes drive from here. Check out Ghoom & Its Map to see the location. I suggest that you contact Chooki Sherpa (The Guest Relation Executive) before making travel plans and reservations. She is a very helpful lady and will guide you with the best rooms. You will get her contacts below. Ghoom Monastery Road, Ghoom, Darjeeling 734 102, India. If you like to stay remotely and away from the township, then Sterling Resort is okay.... it's located in Ghum area at the end of a steep uphill road and 8kms from the town (takes about 30 minutes by car). You will need a vehicle to move around from this place. The Old Ghum Monastery is however located next to it. April-May is a good time to visit Darjeeling and surrounding areas but also the high season... expect heavy rush. 1. I will stay at Sterling resort near Ghoom monastry road, can you tell me what will be my expense to come to Darjeeling Mall area everyday and how much is the distance. 2. Can you inform me about a few good restaurant which are hygenic (Indian/ Continental/ Chinese)and serves a good variety. 3. Can you give me a suggested things to do keeping in mind that I have a small child and will not like to move very early or travel very long distance. 4. In the month of May can I ride the famous toy rain from Ghoom to Darjeeling? Hi, Sterling resort is not a good place to stay if you are planning to visit the mall area frequently. You will need a hotel transport and you should check with the hotel about the rates. The main road is quite some distance from Sterling, which is walkable but not sure if you want to do that with a 5 year old child. Sterling is located in Ghoom and at the end of a narrow road that branches off the highway NH55. However from the main road you will get shared Jeep up to Darjeeling town which is about 9km from Sterling (about 25 minutes drive). From Darjeeling, a private taxi may charge around Rs. 400-500/- for a drop to Sterling. So, it's a bad idea to stay at Sterling and plan most of your time in Darjeeling town where most attractions, activities and eateries are centered. I know Sterling offers lease holiday options and you may have already paid for that. 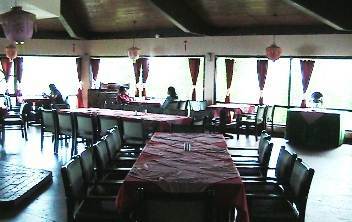 Glenary's (on Nehru road that leads to Mall) and Park (on Laden La road) are two of the best restaurants in Darjeeling. Keventer's (on Nehru road) is great for breakfast and tea. I have discussed all attractions and activities of Darjeeling in my site. You should be able to choose what may suit you. Yes, you will get toy trains between Darjeeling and Ghoom in May.